This group, which includes all living amphibians, as well as their extinct relatives, goes by two formal names: Lissamphibia or Amphibia. Bolt, J. R. 1991. Lissamphibian origins. Pages 194–222 in: Origins of the Major Groups of Tetrapods: Controversies and Consensus (H. P. Schultze and L. Trueb, eds.) Cornell University Press, Ithaca, NY. Duellman, W. E. and L. Trueb. 1994. 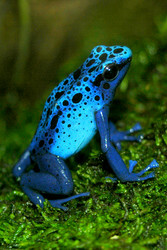 Biology of Amphibians. Johns Hopkins University Press, Baltimore. Feller, A. E. and S. B. Hedges. 1998. 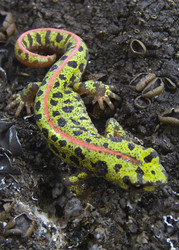 Molecular evidence for the early history of living amphibians. Mol. Phylogenet. Evol. 9: 509– 516. Hedges, S. B. and L. R. Maxson. 1993. A molecular perspective on lissamphibian phylogeny. Herpetol. Monogr. 7: 27–42. Trueb, L. and R. Cloutier. 1991. A phylogenetic investigation of the inter- and intrarelationships of the Lissamphibia (Amphibia: Temnospondyli). Pages 223–313 in: Origins of the Major Groups of Tetrapods: Controversies and Consensus. (H. P. Schultze and L. Trueb, eds.) Cornell University Press, Ithaca, NY. Trueb, L. and R. Cloutier. 1991. Toward an understanding of the amphibians: two centuries of systematic history. Pages 175–193 in: Origins of the Major Groups of Tetrapods: Controversies and Consensus. (H. P. Schultze and L. Trueb, eds.) Cornell University Press, Ithaca, NY. Zardoya, R. and A. Meyer. 2000. 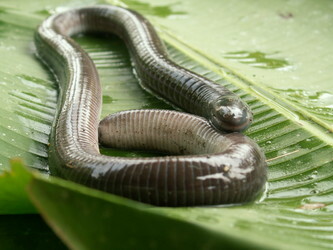 Mitochondrial evidence on the phylogenetic position of caecilians (Amphibia: Gymnophiona). Genetics 155:765-775. Zardoya, R., and A. Meyer. 2001. On the origin of and phylogenetic relationships among living amphibians. PNAS 98:7380-7383. AmphibiaTree. The mission of this project is the realization of a comprehensive phylogeny of all taxa of extant and extinct amphibians. Page: Tree of Life Living Amphibians. Frogs and toads, salamanders and newts, and caecilians. Authored by David Cannatella. The TEXT of this page is licensed under the Creative Commons Attribution License - Version 3.0. Note that images and other media featured on this page are each governed by their own license, and they may or may not be available for reuse. Click on an image or a media link to access the media data window, which provides the relevant licensing information. For the general terms and conditions of ToL material reuse and redistribution, please see the Tree of Life Copyright Policies.